SANTA FE, New Mexico, September 15, 2020 (ENS) – The New Mexico Environmental Law Center today appealed to the U.S. Supreme Court to reverse a lower court decision that allows uranium mining in the Four Corners region of New Mexico. The appeal claims the mine would contaminate drinking water used by some 15,000 Navajo people. 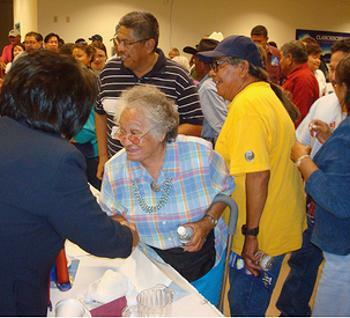 Two community groups – the Eastern Navajo Dine against Uranium Mining and the Southwest Research and Information Center – represented by the New Mexico Environmental Law Center, have been fighting the U.S. Nuclear Regulatory Commission and Hydro Resources, Inc., for the past 16 years, demanding that they keep out of Navajo communities in New Mexico. Today they turned to the highest court in the United States. The appeal contends that a two-to-one decision by the 10th Circuit Court of Appeals in March threatens all of the residents in the area with radioactive contamination as the mine endangers the sole source of drinking water for some 15,000 people in the Crownpoint and Church Rock communities. The Nuclear Regulatory Commission has granted a license to mine uranium in Crownpoint and Church Rock to Hydro Resources, a subsidiary of the Texas-based Uranium Resources, Inc. The 10th Circuit Court of Appeals ruled that Hydro Resources Inc.’s Section 8 property in Church Rock is not in Indian Country. The U.S. Environmental Protection Agency, with the Navajo Nation as intervenor, had argued previously before the 10th Circuit that because “the community of reference,” or Churchrock, is in Indian Country, Hydro Resources’ land must be considered Indian Country, too. During the administrative proceeding after which the Nuclear Regulatory Commission granted Hydro Resources a uranium mining license, Eastern Navajo Dine against Uranium Mining, ENDAUM, presented evidence that the proposed uranium mining operation would contaminate large areas of groundwater, including the Navajo communities’ primary drinking water source. ENDAUM argued that the Nuclear Regulatory Commission changed its interpretation of its regulations governing radioactive air emissions to accommodate Hydro Resources’ operations, which would result in exposing Church Rock residents to levels of radiation in excess of regulatory limits. The Navajo group also argued that Hydro Resources’ groundwater reclamation plan would fail to protect drinking water, and that the government is not requiring an adequate bond to clean up the mine should Hydro Resources abandon the site. However, in March 2010, a three judge panel refused to overturn the NRC’s licensing decision and on May 18 the full 10th Circuit Court of Appeals refused to rehear ENDAUM’s arguments, finding that the company’s Section 8 property is not in Indian Country. “URI’s objective is to be in a position to begin uranium production in New Mexico by the first half of 2013, assuming the renewal processes move forward in a timely manner, a recovery in uranium prices and the availability of financing for the necessary capital expenditures to build the infrastructure,” said Ewigleben. Uranium Resources has one of the largest uranium holdings in the United States. The company argues that its mine should be allowed to proceed because New Mexico has the largest uranium resource base in the country and because domestic uranium production supplies less than 10 percent of U.S. nuclear power plant fuel needs. “Our project will be a major contributor to addressing the need for domestic uranium production to supply U.S. nuclear power plant needs,” Ewigleben said. “Our license will allow us to produce one million pounds of uranium per year for the initial project, after which we will demonstrate certain restoration parameters and can then move forward to produce up to three million pounds per year,” he said. Jantz says that the 10th Circuit Court of Appeals decision upholds the Nuclear Regulatory Commission’s decision that Hydro Resources does not have to clean up existing Cold War-era radioactive waste on its Church Rock Section 17 property. “The waste currently exposes residents to dangerous levels of radiation that are above regulatory limits; new mining would add even more radioactivity to the air,” says Jantz. “We thank Jantz, the New Mexico Environmental Law Center and the whole team for continuing the good fight on our behalf,” says Larry King, ENDAUM board member and one of the 15,000 Navajo people who would be impacted by the Hydro Resources mine. The Church Rock community has been contending with uranium contamination since the 1970s. On July 16, 1979, the dam at the United Nuclear Corporation’s Church Rock Uranium Mill broke and spilled 1,100 tons of milled uranium ore and 94 million gallons of heavy metal effluent into the Puerco River – the largest release of radioactive waste in U.S. history. The Church Rock Uranium Monitoring Project was initiated by Churchrock Chapter of the Navajo Nation in 2003 to assess environmental impacts of abandoned uranium mines and build capacity to conduct community-based research with policy implications. Their May 2007 report found that significant radiation from both natural and mining sources remains in the area and the community is dedicated to finding remedies for this contamination.